When deciding how to plant a tree, the most important considerations are choosing the right tree and placing it in the right spot. Trees vary widely in their needs for space, light, moisture, and soil conditions. Take the time to choose a tree that will thrive in the conditions you can provide. Consult guides specific to your region or seek help from professionals at your local nursery or garden center. Once you've chosen a tree, you'll need to prepare your site for planting. Before digging, contact your utility company, so they can mark the locations of underground lines. Dig a hole a foot deeper than and twice as wide as the root ball of the new tree. Loosen the soil at the bottom and sides of the hole, so roots will be able to easily penetrate the soil. Gently remove tree from the container. If roots are growing in a circular pattern around the root ball, slice through the roots on a couple of sides of the root ball. For trees wrapped in burlap, remove the string or wire to remove the burlap. Gently separate circling roots on the root ball. Gently guide the tree into the hole. Build soil up and around the roots if necessary, so the tree is at the same soil level as it was originally grown. Backfill the hole with existing soil that has been amended with peat moss or compost. At this time you can also add fertilizer such as bone meal or any other fertilizer formulated to stimulate root growth when transplanting. Water the tree. Insert a garden hose into the backfilled soil and allow water to trickle into the soil to fill the hole. Caring for the tree once it is planted, is an important step in how to plant a tree. Mulch around the tree. Apply about three inches of mulch in a three-foot diameter around the base of the tree, but don't allow mulch to touch the tree's trunk. The mulch will help conserve moisture and protect the trunk from passing lawn mowers. Stake the tree, only if necessary. If the tree is grown and dug properly at the nursery, staking is generally not necessary. Trees establish more quickly and develop stronger trunk and root systems if they are not staked when planted. If staking is necessary for support, use two stakes and a wide, flexible tie material to hold the tree upright, provide flexibility, and minimize injury to the trunk. Remove support staking and ties after the first year of growth. Provide regular watering. Keep soil surrounding the tree moist but not soaked. Always feel the soil before watering, as over-watering can also harm the tree. When soil is dry below the surface of the mulch, it's time to water. You will probably need to water at least once a week, barring heavy rain, and more often during hot weather. Continue until mid-fall, tapering off when lower temperatures call for less-frequent watering. Now that you know how to plant a tree, the next step is deciding when to plant. 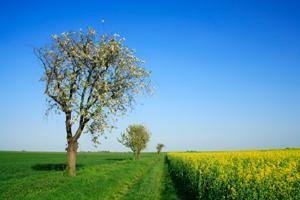 Spring and fall are generally the best times to plant a tree. This gives the tree time to acclimatize before intense summer heat or winter cold arrives. In areas without cold winters, trees may be planted during the winter. In northern climates, spring planting gives the tree more time to get established before the harsh winter.